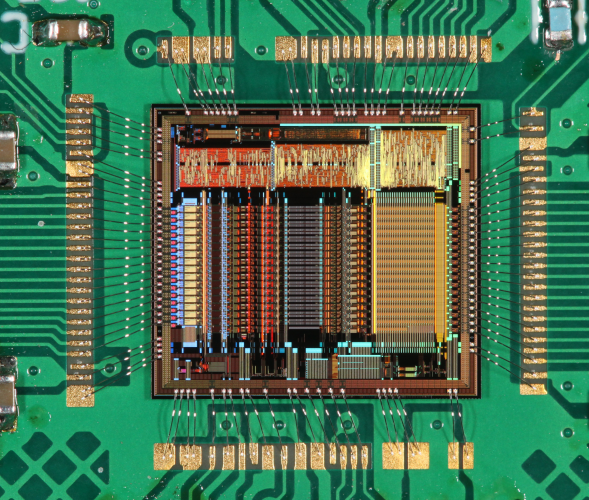 The IDE3380 is a general-purpose integrated circuit (IC) for the readout of photon detectors, such as photomultiplier tubes (PMTs), silicon photomultipliers (SiPMs), and multi-pixel photon counters (MPPCs). The IC has 16 input channels and one summing channel. Each channel can be used for pulse-height spectroscopy and timing. The summing channel is important for the readout of detector arrays with monolithic scintillators. The programmable shaping time of 200 ns, 400 ns, 800 ns, or 1600 ns allows for pulse-height spectroscopy using various scintillators. The current-mode input stage (CMIS) is designed for large negative charge (-16 nC, -8 nC, -4 nC, -0.4 nC) depending on the programmable attenuation and it accommodates large capacitive load (several nF) and large leakage current (up to –10 μA from dark counts). Alternatively, the CMIS can be bypassed to allow for positive charge depending on programmable gain (+40 pC, +4 pC, +0.4 pC). 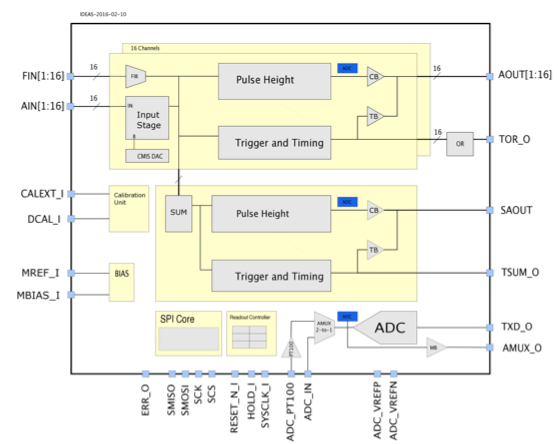 The IC contains one 12-bit analog-to-digital converter (ADC) that allows for digitization of the pulse heights from all channels, including the summing channel at a sampling rate of 50 ksps. Every channel output is available for external use and provides either the pulse height or a digital trigger/timing pulse with fixed width or time-over-threshold. The programmable channel output facilitates many applications, such as external waveform sampling and digitization, pulse height and time spectroscopy, pulse counting, and triggering. The IC operates at 3.3 V supply voltage and dissipates about 15 mW without CMIS and 30 mW with CMIS active. To save power, any channel or function can be powered down. The ASIC has a serial peripheral interface (SPI) for programming its register settings and for slow ADC data readout. Faster readout with up to 1 Mbit/s is possible via a serial data transmission line. The IC has been designed to be latch-up immune and resilient to single event upsets. Supported by the Galao ROIC Development Kit. The spectrum shown in the plot below was obtained with the IDE3380 on a Galao ROIC Development Kit, using an SensL SiPM combined with a LaBr scintillator. The source of the radiation was Eu-152 (x-rays Kalpha @ 39.91 keV and Kbeta @45.7 keV). Gamma ray lines are shown at 121.8, 244.7, 344, 411, 443, 778, 867, 964 and 1112 keV. 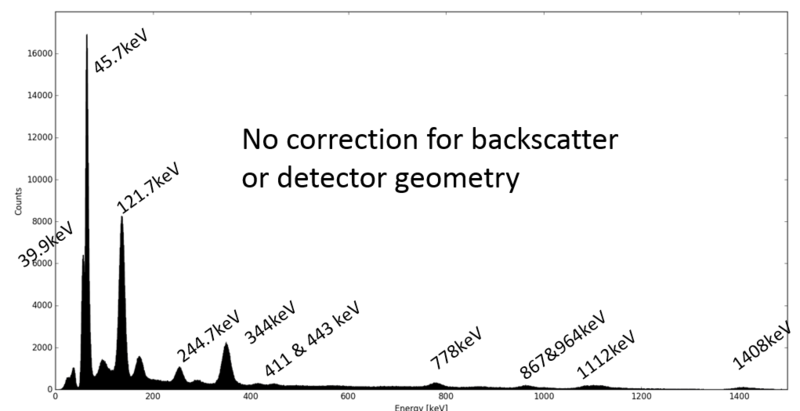 This was carried out with no corrections for backscatter or detector geometry.